DIE Mercurii, videlicet, 21 die Aprilis. Committee for Relief of Berwick. Sir Pierce Crosby's Order to examine Witnesses. Coat and Conduct Money levied in Middlesex, to be re-paid by Hill and Browne. Capt. Skip with sent for. Bill of Attainder of E. Strafford brought up from the Commons. To be considered of Tomorrow. The Counsel on both Sides proceeded in the Cause of Sutton Marsh. The Counsel of the Lord Herbert desired to see the Articles brought into this House by Order; but the Counsel of the Earl of March excepted against it, until the Lord Herbert's Counsel had shewed their Title. The Judgement of the House was demanded herein; and the Counsel being withdrawn, the House took it into Consideration, and did resolve that, first, both the Articles and Evidences on both Sides should be brought into this House, and read before the Counsel of either Side speak; and the Plaintiff's Counsel is to take their own Course to manage and use them as they shall see Cause. The Counsel on both Sides were called in; and the Speaker told them what their Lordships had resolved; and so the Counsel went on in the Cause. But the Lord Herbert's Counsel producing one George Johnson, a Servant of Sir Cor. Vermuden, to prove, as a Witness, that Sir Cornelius Vermuden had the Consent of the Tenants of Sutton Marsh before he began his Banking, and to prove what Money had been disbursed therein, the Counsel for the Earl of March excepted against the said Johnson for being a Witness, alledging that he was a Party interested in the Cause, as being joined with Sir Cor. Vermuden in his Patent. It was again declared, on the other Side, That the said Johnson was but in Trust, and therefore desired the Judgement of the House herein. The Counsel being withdrawn, the Lords considered of it, and Resolved, That, when the Deed of Trust is declared, and it appeared that the said Johnson is but merely in Trust, and is to receive no Profit therein, and this Witness being but collateral, he may be heard; but, if he have real Interest in it, he is not to be heard, because he may speak for his own Benefit and Advantage. And further it was thought fit, if there be any Deed to declare the Use of the said Trust, that it be produced this Afternoon, at Two a Clock; and then this Cause is to be further heard. L. Bp. of Lincolne. Ds. Wentworth. Their Lordships, or any Five or more of them, to meet this Afternoon, at Two a Clock. Ordered, That the Business of the Scotts Treaty shall be peremptorily debated To-morrow Morning. Ordered, That the Lords Committees formerly appointed in Sir Peirce Crosebie's Cause, or any Three of them, shall have Power to take the Examinations of his Witnesses in Writing, in the Cause depending between him and the Earl of Strafford, at such Time and Times as their Lordships shall appoint; and that the Earl of Strafford, or his Solicitor, shall have Notice of the Time of such Examinations, that he may cross-examine the said Witnesses if he please. Ordered, That the Cause concerning Sutton Marsh shall be heard again by Counsel on both Sides, this Afternoon, at Three a Clock. 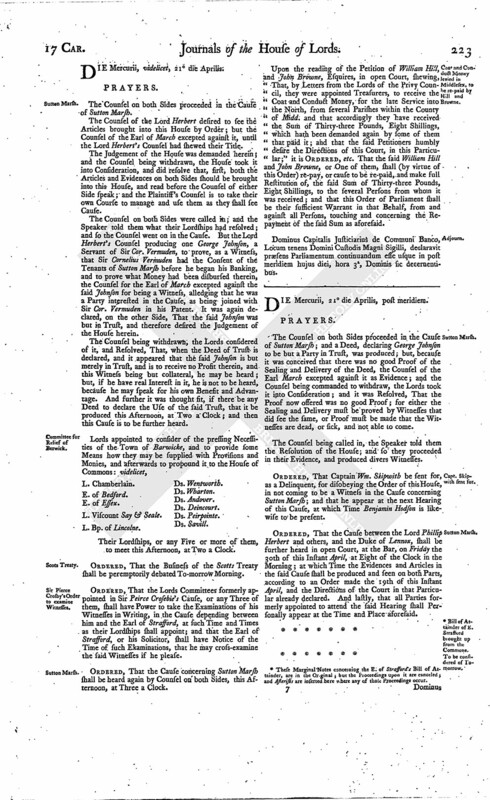 Upon the reading of the Petition of William Hill, and John Browne, Esquires, in open Court, shewing, That, by Letters from the Lords of the Privy Council, they were appointed Treasurers, to receive the Coat and Conduct Money, for the late Service into the North, from several Parishes within the County of Midd. and that accordingly they have received the Sum of Thirty-three Pounds, Eight Shillings, which hath been demanded again by some of them that paid it; and that the said Petitioners humbly desire the Directions of this Court, in this Particular;" it is Ordered, etc. That the said William Hill and John Browne, or One of them, shall (by virtue of this Order) re-pay, or cause to be re-paid, and make full Restitution of, the said Sum of Thirty-three Pounds, Eight Shillings, to the several Persons from whom it was received; and that this Order of Parliament shall be their sufficient Warrant in that Behalf, from and against all Persons, touching and concerning the Repayment of the said Sum as aforesaid. Dominus Capitalis Justiciarius de Communi Banco, Locum tenens Domini Custodis Magni Sigilli, declaravit præsens Parliamentum continuandum esse usque in post meridiem hujus diei, hora 3a, Dominis sic decernentibus. The Counsel on both Sides proceeded in the Cause of Sutton Marsh; and a Deed, declaring George Johnson to be but a Party in Trust, was produced; but, because it was conceived that there was no good Proof of the Sealing and Delivery of the Deed, the Counsel of the Earl March excepted against it as Evidence; and the Counsel being commanded to withdraw, the Lords took it into Consideration; and it was Resolved, That the Proof now offered was no good Proof; for either the Sealing and Delivery must be proved by Witnesses that did see the same, or Proof must be made that the Witnesses are dead, or sick, and not able to come. The Counsel being called in, the Speaker told them the Resolution of the House; and so they proceeded in their Evidence, and produced divers Witnesses. Ordered, That Captain Wm. Skipwith be sent for, as a Delinquent, for disobeying the Order of this House, in not coming to be a Witness in the Cause concerning Sutton Marsh; and that he appear at the next Hearing of this Cause, at which Time Benjamin Hodson is likewise to be present. 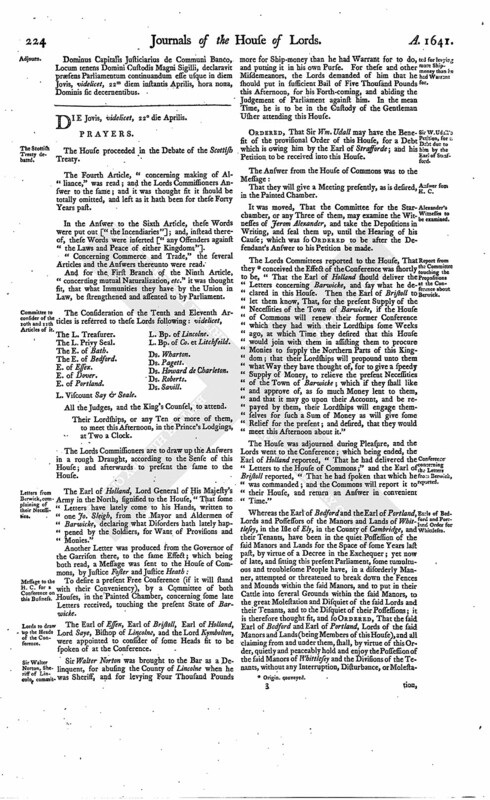 Ordered, That the Cause between the Lord Phillip Herbert and others, and the Duke of Lennox, shall be further heard in open Court, at the Bar, on Friday the 30th of this Instant April, at Eight of the Clock in the Morning; at which Time the Evidences and Articles in the said Cause shall be produced and seen on both Parts, according to an Order made the 19th of this Instant April, and the Directions of the Court in that Particular already declared. And lastly, that all Parties formerly appointed to attend the said Hearing shall Personally appear at the Time and Place aforesaid. (fn. 1) Bill of Attainder of E. Strafford brought up from the Commons. Dominus Capitalis Justiciarius de Communi Banco, Locum tenens Domini Custodis Magni Sigilli, declaravit præsens Parliamentum continuandum esse usque in diem Jovis, videlicet, 22m diem instantis Aprilis, hora nona, Dominis sic decernentibus. 1. These Marginal Notes concerning the E. of Strafford's Bill of Attainder, are in the Original; but the Proceedings upon it are canceled; and Asterisks are inserted here where any of those Proceedings occur.